We open in the call center of the Hero Hotline. Mrs. Jackson enters, and is berated for her tardiness. Mrs. Jackson is one of the facilities resident heroes for hire, Microwavabelle (or Microwave Mom). Cybernetic assistant, 500Z-Q (Soozie Q in people-speak) informs Microwave Mom that there is a reporter from The Observer waiting to interview her. Mom enters the squad room and we are introduced to the "team". Mister Muscle (Formerly known as Flex, Mister Mighty, Brother Bicep): Super strong body builder, super self-conscious. Diamondette: (R) Can make her hands as hard as diamonds. Has smoking addiction. Hotshot: (L) Shoots fireballs from hands. Really digs Diamondette. Private Eyes: Eyewear grants him vision powers. Microwavabelle/Microwave Mom: Generates heat in objects. Fred: Invisible man. Some believe him not to exist, claiming it is simply Voice-Over throwing his voice. Stretch: Can... stretch. Every superhero team needs one of these, right? Microwave Mom introduces herself to Ms. O'Flaherty, the reporter from the Observer. Before they get too far into their interview, a job comes across the radio. The job is to retrieve a missing ring, Stretch and Private Eyes head out. Microwave Mom and Ms. O'Flaherty are able to watch the job in progress via one of SOOZIE-Q's many monitor screens. This device is used to frame much of the story, and is a very creative way of introducing the reader to the cast and their mission. Stretch and Private Eyes arrive at the corner of 23rd and Bleecker to attend to the emergency. It turns out that a man dropped his fiance's ring down a storm drain. Where is Superman when you need him, right? The heroes for hire use their specific gifts and rescue the ring from its cell of sewage. We jump back to Hero Hotline HQ, just as Mister Muscle (or was that Brother Bicep?) is called into action. There is a battered wife calling in for help. Mister Muscle comments that he loves to "deal with" bullies, and heads into action. As he leaves he passes another cast member. Miss Boulder: Country-lookin' gal, carries a gee-tar. Romantically linked with Private Eyes. What does she see in him? Back to the ring-rescue. The civilians tell the heroes that it was an earthquake that caused them to drop the ring down the grate. Private Eyes expresses disbelief citing the scientific impossibility of such an event occurring in that part of the country. Moments later, wouldn'tcha know it... the Earth's a-quakin'. Back at H-H-H-Q, another job comes over the radio. This time it's an older woman who claims to be visited by martians every night. Voice-Over is given the gig, and decides to take Invisible Fred along for the ride. We join Mister Muscle on his call. He timidly enters the battered woman's home, offering to provide her with literature that may be of help. She begins telling him about her relationship with her husband, and how (and why) it deteriorated so. As they talk, her drunken husband stumbles in. He suggests Mister Muscle is there for adulterous reasons. He raises his hand to his wife, and our man intervenes... seemingly crushing the husband's arm, and threatening to do worse if the abuse continues. Back with Stretch and Private Eyes, they discover that the cause of the earthquakes is an armored beast of a man is jack hammering in a nearby building. It is the Quakemaster, later of the Secret Society of Super-Villains... SOOZIE-Q calls for all available heroes to head out to the scene, ASAP. After having their heads handed to them for much of the battle, the Hero Hotline All-Stars realize they must work in tandem to down this foe. By combining their powers, they make short work of the villain. We now join Voice-Over and Fred as they speak to an elderly woman about her martian visitations. V-O cannot control his laughter, and offers to leave Invisible Fred behind for the night so he may bare witness to the martian threat. The old woman claims that she can actually see Fred, which only amuses V-O more. Back at headquarters, the squad drags the Quakemaster in to have his rights read. SOOZIE-Q attempts to explain his rights, however, QM becomes belligerent. He is knocked out by a sedative gas... SOOZIE decides she'll try explaining his rights to him a bit later on. The day shift ends, and the team disperses for the evening. Ms. O'Flaherty thanks Microwavabelle for taking the time to speak with her. The night call center crew takes over, and we are out. It's interesting... I actually read this issue twice for this review. The first time I read it, I really didn't like it. Like, it was fine... I guess, just not nearly as charming as I felt it took itself. This is not 'Mazing Man, and I suppose it would be unfair to compare the two just because of the shared creative team. I hate feeling my biases enter into my reviews... so, I set the book down. I returned several hours later, and gave it another look through. This time without visions of a pint-sized bucket-headed do-gooder dancing through my head... and I'm glad that I did. This really was a lot more fun than I expected it to be. The characters really jumped out at me upon my second read. They appeared more well-rounded, and I found myself noticing quirks that I had missed the first time through. Reading the character bios that closed the book out helped out a bit too. Microwave Mom is very much the "mom" of the group. We learn that she has three children of her own (one of which the cause of her tardiness in the open), and that she is a widow. Diamondette is struggling to quit smoking. She is constantly shadowed by the much-younger Hotshot, who has romantic feelings toward her. Private Eyes attempts to interject logic into the fantastic world he inhabits. Questioning the "impossibility" of something in the DC Universe makes him an interesting fellow. His relationship with Miss Boulder has not been fully explored at this point... it is, however, intriguing. Despite Mister Muscle's large size, he appears to be quite vulnerable. He states his hatred for bullies, even though no bully in their right mind would mess with him. His timidity during his call was also something of a red-flag. Perhaps I'm reading too much into it... I guess we'll find out. All we know about Stretch is that he goes way back with the "Coordinator", the boss of the Hero Hotline. He uses the same Gingold as Ralph "Elongated Man" Dibney, and he appears to have a problem with the more menial nature of the Hero Hotline calls he goes out on. Lastly... my man, Voice-Over. What a character, right? What an absolute jackass... but, he's awesome. I'm very curious to see if Fred is an actual character, or simply a trick V-O is playing on everyone. This is the main thing that would bring me back for the next issue. Bob Rozakis has a wonderful knack for dialog. A bit corny at times, just as in 'Mazing Man... but great fun... and not too silly. The art in this issue is reminiscent of a "lite" version Keith Giffen's more experimental work. Definitely more follow-able than Hex, however. All of the character models are fantastic, and the costumes really fit the tone of the series. Again, my man V-O... that's an awesome costume! It looks like something off a Slash Maraud cover. Like 'Mazing Man before it, this is a hard one to give a proper recommendation for. While it's most definitely worth the dime-nickel-and-penny I paid for it, I'm not sure how high I would go for this one. 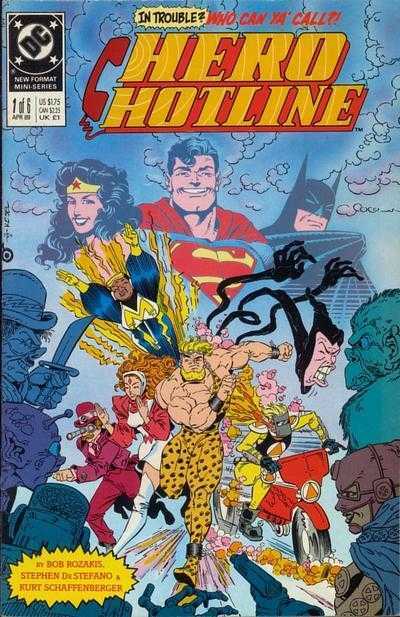 To the shock of absolutely nobody, DC has not made this available digitally, and to my knowledge it has not been collected. If you come across it in the buck-'n-below bins, you can certainly do far worse. Maybe give it a shot. Being a big fan of 'Maze, I've always been wary of this title, but you seem to have answered all my questions, so I'll take your advice & pick it up if I see it cheap! Hello Mark! Thank you for taking the time to stop by! I'm really digging this one thus far... I'm thinking about working the rest of the series into review-format over the next couple of weeks. Glad to find another 'Maze fan, he sadly seems to be lost to limbo. Thanks again for popping in, I'm going to give your Podcast a listen later on today. Really looking forward to it!